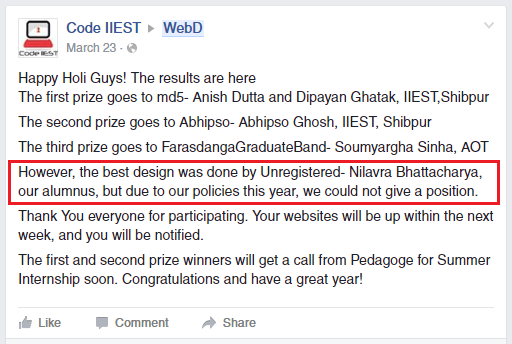 INSTRUO – the annual technical fest of my alma mater (IIEST Shibpur) – came back with its web development competition WebD again in 2015. The problem statement was more challenging than last year. The competition was restricted to undergraduate students only, and I was now an alumnus. Still, the web developer in me could not hold back. Though the organizers could not award me a position due to the policies, they did mention that my entry had the best design. FOR: Competition Entry for WebD event, organized under INSTRUO 2016, at IIEST Shibpur, India. a “your order” section to review and confirm the order. Maximum order quantity is 10 for any food item. User should be able to edit and review order before confirmation. Once order is placed, order number should be displayed. No server-side code is required anywhere. Login data taken from users.json file containing userid, username and MD5 hashed passwords, as part of problem statement. Food menu taken from menu.json file. HTML Session storage is used to store order details. jQuery filtering is used to search and filter food items. The menu page, with search and filter options. Each photo is hand-picked to tickle your taste-buds. Order confirmation / home page. Menu page – mobile view. Adding an item to the cart – mobile view. Cart page – mobile view. Cart page – another mobile view. Order confirmed page – mobile view.